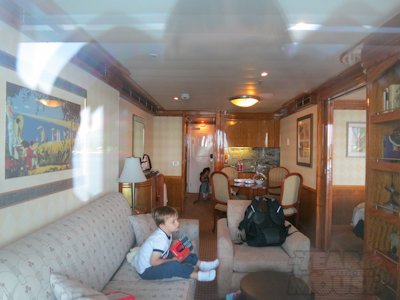 One of the best family vacations we’d taken with Theo was a cruise on the Disney Wonder in September 2011, so deciding to take another Disney cruise didn’t take a whole lot of deliberation. 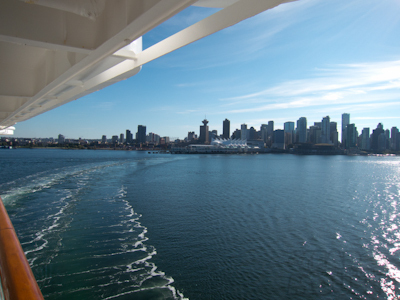 The California Coast cruise is ideal for us–it’s a repositioning cruise that starts in Vancouver and ends in Los Angeles, requiring us to 1) only buy one set of plane tickets, and 2) visit one of our favorite cities in the world, Vancouver, where we honeymooned. Perfect. This past June I turned 40. 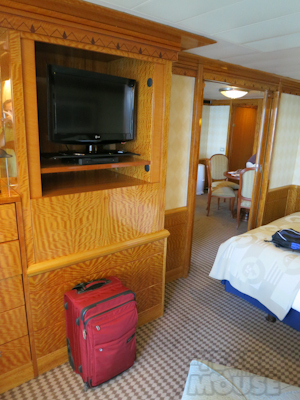 To celebrate, rather than throwing some big party for my friends and family, we decided to splurge on our cruise and get a suite with concierge service. 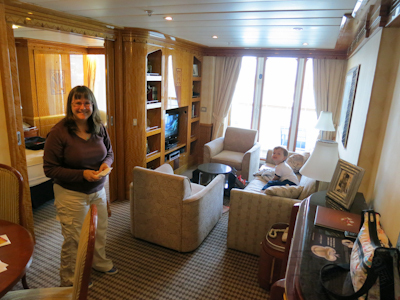 When we travel, we try to get suites as often as financially possible. The kids sleep better in their own room and we can keep the light on and do crazy things like sharing a glass of wine or reading before we go to bed, rather than laying there, silent and motionless, in the dark while our light sleeping night owls try to their hardest not to fall asleep. Good times, good times. The concierge service came with the suite. 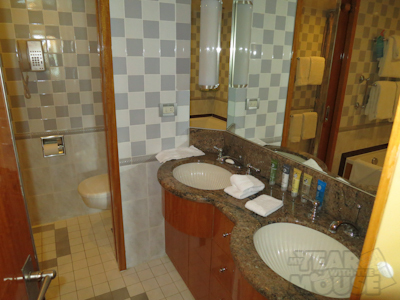 To be honest, we didn’t think we would use the service much and if we could have gotten a suite without concierge we probably would have, but that would have been so short-sighted because we did end up using the concierge, a lot, and now it will be hard to go back to cruising the regular way. *sigh* Concierge offers shoreside services before you board, which I didn’t take too much advantage of, booking our own Port Adventure (excursion). Checking in at the terminal, you have to wait in the regular security line but when you check in to the boat, you get the earliest boarding time and your own special line to wait in, which wasn’t a line at all since we got right on. 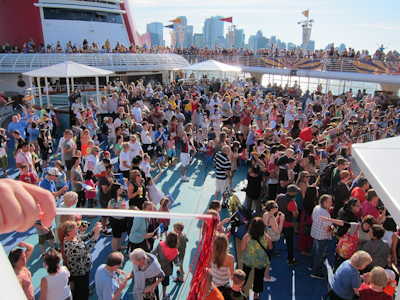 It was great, but I can see how on one of the really crowded, bigger ships, it would be really, REALLY great. 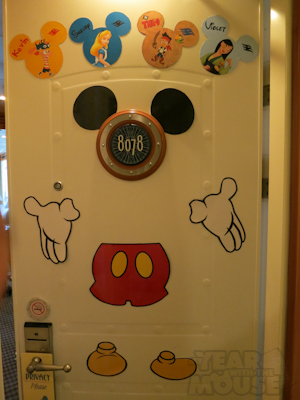 We were in room 8078 and the first thing I did when we stowed our stuff–well, first we ooohed and aaahhhed at the room, and then we stowed our stuff, but the next thing I did was decorate our door. The doors are metal so magnets stick to them. I got some DISigns (signs) off of DISboards and made myself at home. Okay, I’m getting ahead of myself again. 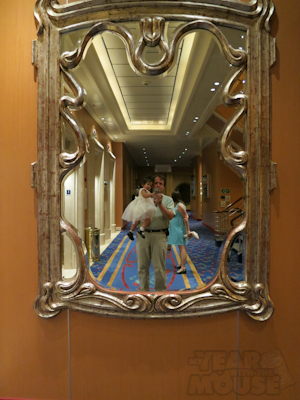 The first thing we did is board the ship, and the fun part of that is that they call out your family name as you walk in and all the crew claps for you like you’re a celebrity. Then since we were concierge, we got to go to a special concierge reception with free snacks (and free booze!) where we got to meet our concierge team, sign up for kid’s activities and port adventures, and hang out. Unfortunately the kids weren’t up to hanging out so we only stayed a brief time there. I understand that on the two larger ships, the Dream and the Fantasy, there’s a special concierge lounge, but on the Wonder they only hold a couple of concierge activities. That’s okay, the kids were bored through them anyway. 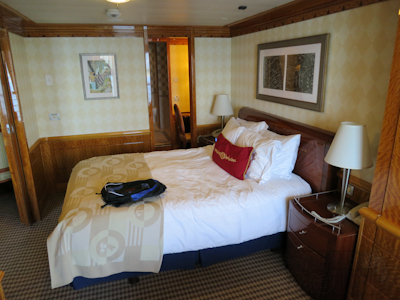 THEN we got to our room. The room was, like, huge and gorgeous. And gorgeous. And spacious. And beautiful. And ours. Yeah, baby. I’m already spoiled rotten. 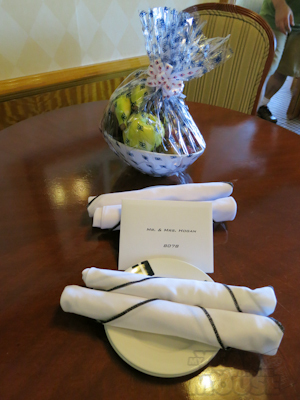 We were greeted with a basket of fresh fruit, which was replenished daily. I loved having a dining table. It was the perfect size for four and while we’d brought our own booster seat for Violet, we could have gotten a high chair. The baby amenities on Disney cruises are awesome. They brought a pack n play which they set up and took down every day so it wasn’t constantly in the way. Violet is still in diapers so they brought us our very own Diaper Genie for easy disposal. I mean, that alone is worth the price of a cruise. Or maybe not, but you know what I mean. 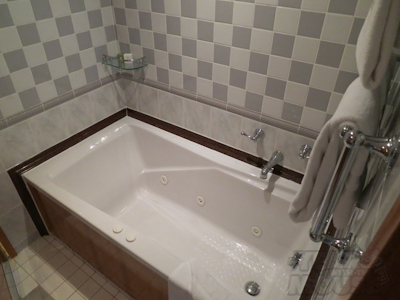 Our bedroom had a lovely bed, our own balcony door, a little desk area, and a two-part bathroom with a jetted tub and a separate toilet/shower area. 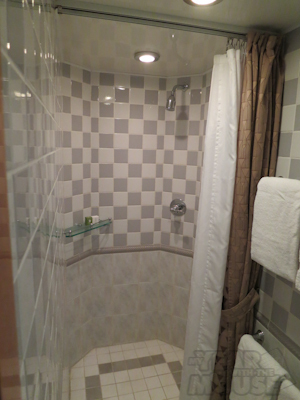 The kids’ room also had their own bathroom with shower so they didn’t have to bug us for ours. Nice. And they also had their own balcony door, and the balcony was shared between the rooms with a partition on either side from the other cabins. Here is a picture I took of the main room from the balcony. Clearly I took this picture through the glass. Why on earth didn’t I open the balcony door and then take the picture??? The couch folded out into a bed, which is where Theo slept. There was also a Murphy bed in the bedroom that could have been made up for the kids, but honestly that would have defeated the entire purpose of having a suite for us, so the couch it was! It seemed perfectly comfortable. We went over to the kids clubs to get Theo and Violet registered. 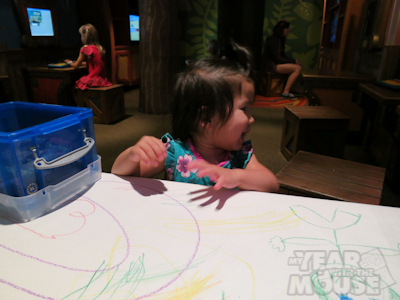 There are several kids clubs but we used three: Flounder’s Nursery for toddlers and babies under 3 and in diapers, the Oceaneer Club geared toward younger kids, and the Oceaneer Lab geared toward slightly older kids. There’s also a tween club and a teen club but obviously we weren’t eligible for those. Kids under 12 can go to either the Club or the Lab as they like. I’ll cover more about the clubs on a different post because we didn’t take many pictures there the first day. They did have family open house times where you can go in and play on the play structure and do the activities as a family, which was great because it gave Violet a chance to hang out there as well. 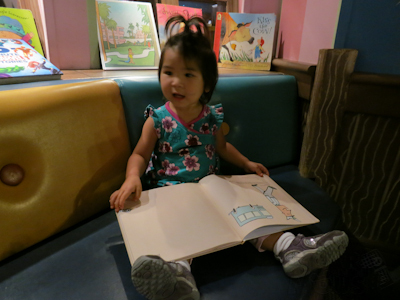 I can’t wait to take a cruise when she’s old enough to be in the real kid’s club instead of Flounder’s. Anyway, Theo headed to the computers but Violet enjoyed the open coloring and a surprise appearance of her favorite book. And we walked around some more. After getting acquainted with the ship, it was approaching Violet’s nap time so we set up the pack n play in the bedroom and Theo and I headed out to the sail away party. This was a deck party by the pools where they introduced the crew and there was lots of singing and dancing and peppy music and it was impossible to not get totally excited about sailing away. I almost cried I was so happy. We attempted to watch from the upper rail and fortunately a nice couple of adults made room for Theo right up against the rail. 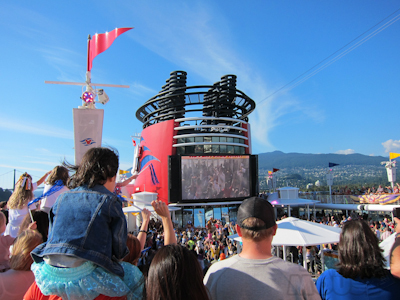 We walked to a different angle to catch the Funnelvision, where they show movies during the cruise. 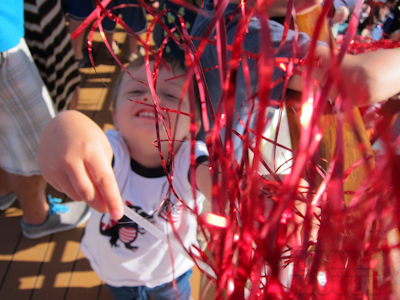 And Theo loved waving the little pom poms the crew members were handing out. When we got back to the room, Violet was asleep and Daddy was relaxing in the living room reading. It was completely awesome having her in the other room where she could sleep in peace but we could still use the room. 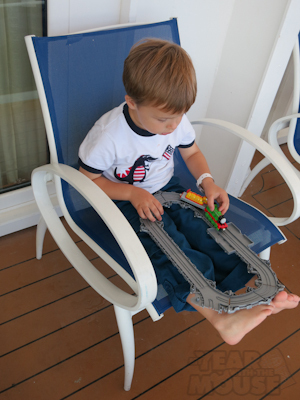 Theo took his travel train set out on the balcony. I love to get my kids dressed up for dinner. Unfortunately Theo was not onboard with this plan at all and every dinner was a struggle. 4-year-olds, what’re you gonna do? The way dining works on Disney cruises is that there are three main dining rooms (MDRs), each with a theme: Triton’s, Parrot Cay, and Animator’s Palate. You rotate each night to a different MDR, but you take your wait staff with you. That part is awesome because you really get to know your wait staff and it’s a lot of fun to see the same faces every night. We started out in Parrot Cay. 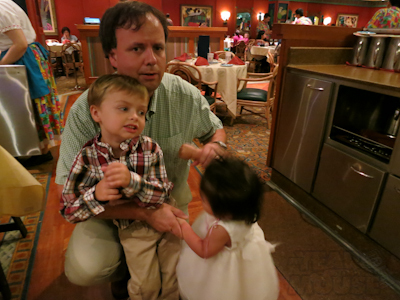 Theo was all camera shy while Violet was doing well. But then Kevin did something really horrible like moving Violet’s water cup or something and this happened. Look, even the high chair has Mickey on it! 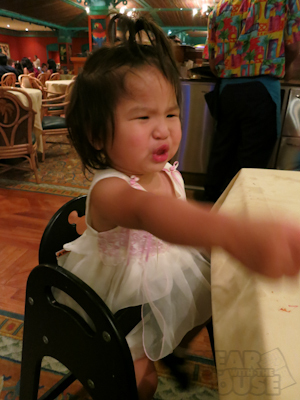 Anyway, Violet got over whatever she was ticked off about in that picture. 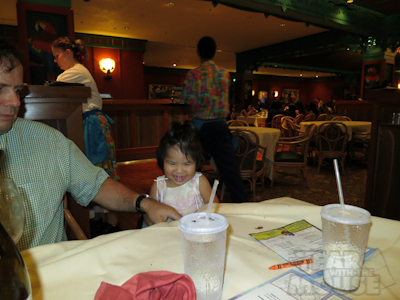 Kid dining is great on Disney cruises. Each night they have a kid’s menu with a kid version of whatever is on the adult menu, then a kid-food menu that doesn’t change. Theo really liked that because he had the mac and cheese every. single. night. To be fair it was really good mac and cheese, but still. 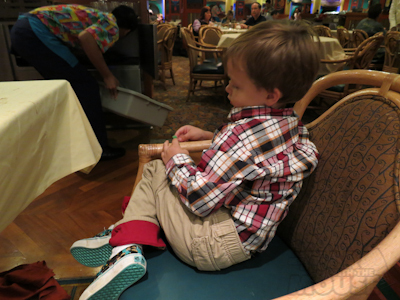 Another nice thing is something we noticed on our last cruise, which is that they get the kid’s meals out right away. It’s wonderful because the kids don’t have to wait for the adults to order or for their food to come, they can just start eating. And the adults don’t have to worry about rushing through either. Another nice thing is that if the kids finish early, you can run them up to the clubs and finish your own meal in peace, which we did one night. However Flounder’s Nursery only has a limited number of spots, so you need to call ahead an arrange that, but more on that later. 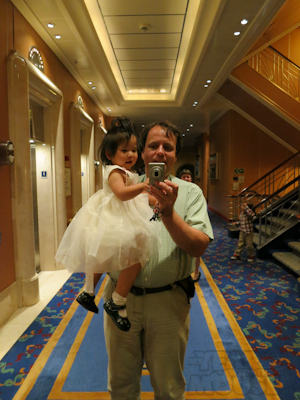 Daddy took some selfies with our pretty girl. One awesome thing about concierge that isn’t available to guests in other staterooms is that you can order food from the MDRs as room service, including a hot breakfast. Everyone can order room service, but it’s a limited menu. Since our cruise was so short (5 nights) we didn’t eat dinner in the room, but we did take advantage of the breakfast once and it was really awesome to enjoy eggs benedict in my PJs. Another awesome thing about concierge is that they can arrange all kinds of things for you, like nursery time. You are allowed to reserve 2 hours per night (so 10 hours in a 5 night cruise) before the cruise starts, and the spots can fill up fast. 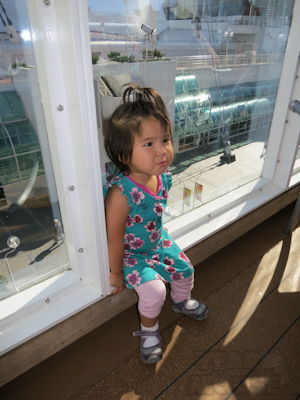 We did this on our first cruise when Theo was 2 and it was a bummer some days because it didn’t leave us a lot of flexibility. 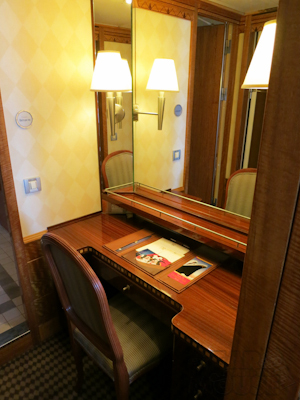 However, with concierge, you can decide last minute and they call and check if there’s room. Let’s just say that we never had a problem with there being room for Violet :). There is a nominal fee for Flounder’s, I believe it’s $6 per hour, and worth every penny. 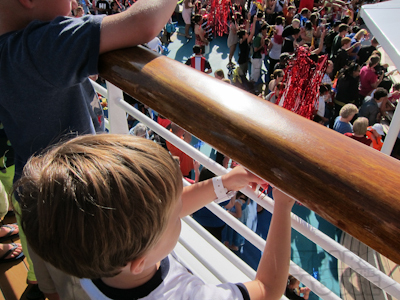 It was a fun-filled first day, and the cruise was just getting started!